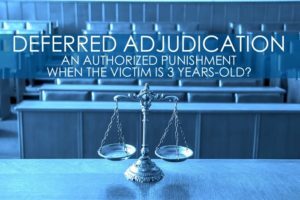 Deferred Adjudication an Authorized Sentence When Victim is 3 Years-Old? Is Deferred Adjudication an Authorized Sentence if Victim is 3 Years-Old? Home » NEWS » Is Deferred Adjudication an Authorized Sentence if Victim is 3 Years-Old? Note: This article contains sensitive subject matter dealing with the sexual assault of a minor. In 2009, John Anthony was indicted for aggravated sexual assault of a child under fourteen years old. In a plea agreement, Anthony pleaded guilty to the charge in exchange for the prosecution’s recommendation of deferred-adjudication with community supervision. Generally speaking, deferred-adjudication is a type of probation in which a defendant enters a plea of guilty, but the judge defers the ruling for a set amount of time. If the set amount of time passes without further criminal activity or other technical violations by the defendant, the judge sets aside the plea and dismisses the case. For Anthony, the trial judge ordered a deferred period of eight years. During this time, the defendant would remain on community supervision, under the watch of a probation officer. The judge listed the victim’s age as three years old on the official trial judge’s order for deferred adjudication—not “under fourteen years old” as was listed on Anthony’s indictment. Several years passed until 2013, when the State moved to adjudicate because Anthony allegedly violated his community supervision directives. Finding the new allegations to be true, the judge adjudicated Anthony guilty and sentenced him to life in prison. Once again, the judgment listed the victim’s age as three years old, not fourteen years old as was listed on Anthony’s original indictment. Anthony appealed his adjudicated sentence with court-appointed counsel, who eventually filed an Anders brief. See Anders v. California, 386 U.S. 738 (1967). While reviewing the Anders brief, the court of appeals became concerned about the discrepancy in the victim’s age listed on the judge’s orders and on the original indictment. Specifically, the court of appeals was concerned that the trial court’s “finding” that the victim was three years old meant that under section 42.12 of the Texas Code of Criminal Procedure, the trial judge was entirely precluded from imposing deferred adjudication in the first place. TEX. CODE CRIM. PROC. Art. 42.12, § 5(d)(3)(B) (West 2006 & Supp. 2015). Additionally, the court of appeals was concerned that the age discrepancy error led to a potential flaw in sentencing. Further, the sentencing flaw potentially pointed to the fact that Anthony’s trial counsel could have been ineffective, possibly inducing Anthony into pleading “guilty” to a deal that should have never been made at all. Accordingly, the court of appeals reversed the trial court’s judgment. The State petitioned the Court of Criminal Appeals to review the case. Can the Trial Court Place a Defendant on Deferred Adjudication for a Sexual Offense involving a 3 Year-Old Victim? Now, the Court of Criminal Appeals must determine whether the potential age discrepancy error on the original indictment and on the trial judge’s orders created a procedural error during sentencing, possibly leading to ineffective assistance of counsel. If the age discrepancy is problematic procedurally, what should happen to Anthony’s original sentence? Here, the Court of Criminal Appeals says that the trial judge properly imposed deferred adjudication. Because the indictment read that the victim was “younger than fourteen years old” and because there is nothing in the trial record to indicate that the State intended to prosecute under more stringent statutes with more stringent punishment guidelines, the CCA holds that the original sentence is proper. Further, the CCA deems Anthony’s previous trial counsel to be effective. Accordingly, the CCA strikes the “three year old” victim language in the trial court’s order, amending the language to reflect that the victim, “was younger than fourteen years of age at the time of the offense.” TEX. CODE CRIM. PROC. art. 42.015(b); TEX. R. APP. P. 78.1(c). Anthony’s sentence of life imprisonment stands because his deferred adjudication was properly imposed in 2009.